I’ve yet to try either of these because the water at the flat I live in, just isn’t getting warm enough at the moment, and in this weather I just can’t be dealing with a cold bath… But they both smell absolutely incredible and I can’t wait to try them. The Lover Lamp Bath Bomb has a combination of smells, vanilla and orange being the strongest, which combine to make a subtle chocolate orange type smell, but without the intensity of super rich cocoa. 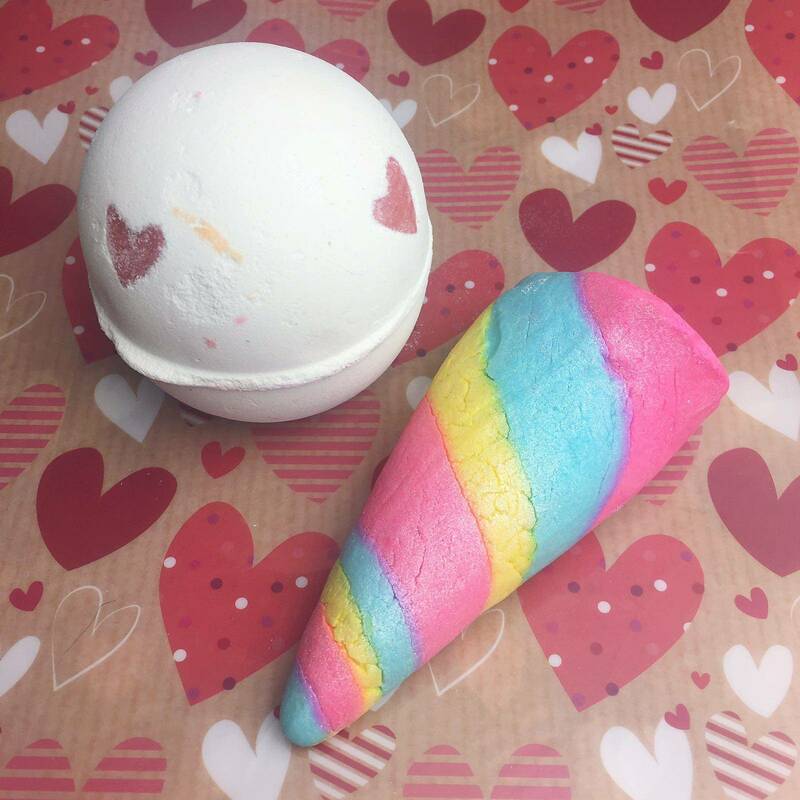 The hearts in the bomb are made from organic cocoa butter, which I expect will melt in the bath and help make my skin silky smooth, similarly to the stars in the ‘Shoot For The Stars’ Christmas bath bomb. I do love a bit of cocoa butter. The Unicorn Horn Bubble Bar is something I had heard of but never tried. If you know me in real life you’re know I’m quite the unicorn fan so was super happy I was able to grab one of these. They’re quite delicate thought and double check when buying that your pretty horn isn’t crumbling a little already. The smell of this is akin to Snow Fairy, however I’m not sure if it’s exactly the same – but definite similar sweet similarities. The main ingredients are three oils: Ylang Ylang, Lavendar and Neroli. Also something worth noting, once you pick this up, you hand will be sparkly for the foreseeable future. I’m looking forward to trying this out and seeing how bubbly it really is! 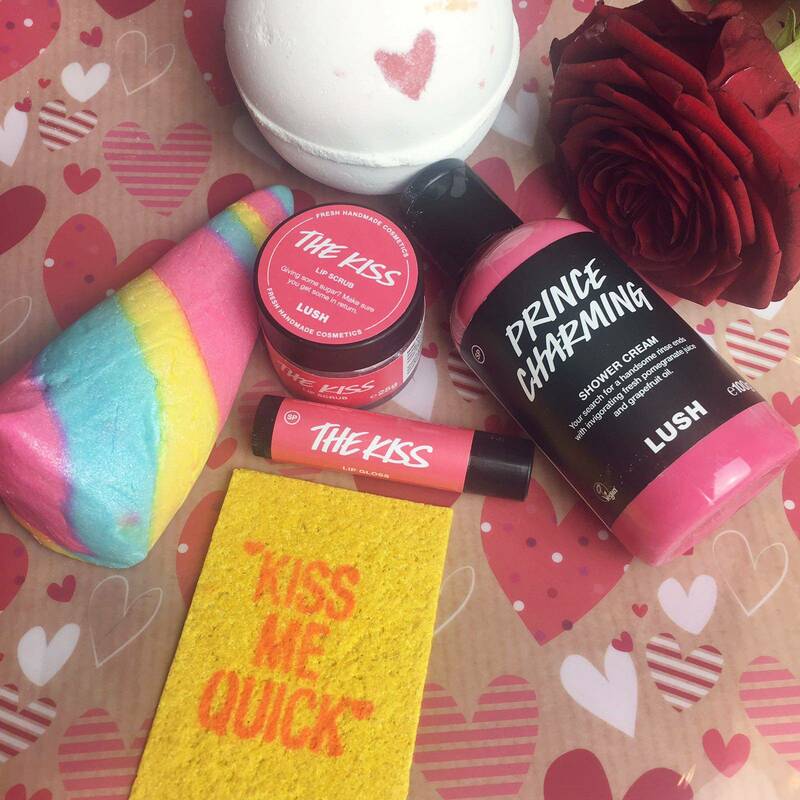 The Kiss products smell deliciously sweet and fruity (although a little different to one another), and are very pink and cute. I’m a huge fan of the LUSH lip scrubs, especially in this cold weather when dry lips seem to be a thing far too often. 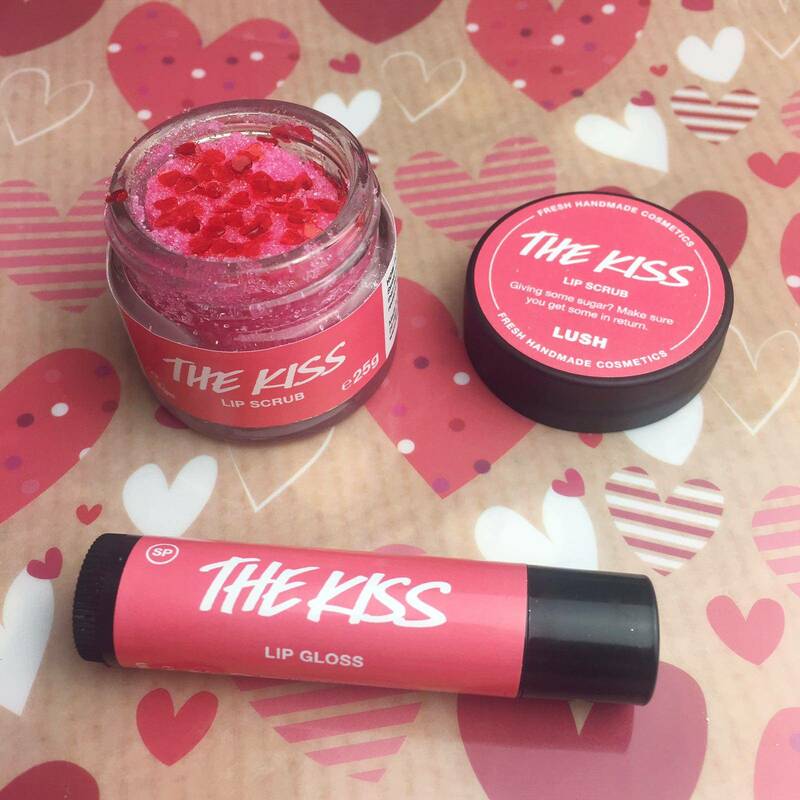 I already have a Sugar Plum Fairy and a Bubblegum Lip Scrub (don’t think I’ll be needing to buy another for a while), but I saw the little hearts in The Kiss Lip Scrub and I was instantly sold. Some of the ingredients the pot contains are Sugar, Mandarin Oil, and tiny red edible hearts. I gently rub these over my lips to help with dryness and also to remove stubborn lipstick colours at the end of a night out. Plus they’re all edible (and taste pretty good), so there’s no need to worry if you ‘accidentally’ eat some of it. The Kiss Lip Gloss has a very pale pinky colour and subtly shimmery, almost silver/lilac sheen. I think this would look nice over a bolder coloured lipstick (which I will try soon) and the product actually reminds me of the fruity lip balms I had as a youngester from teen magazines. 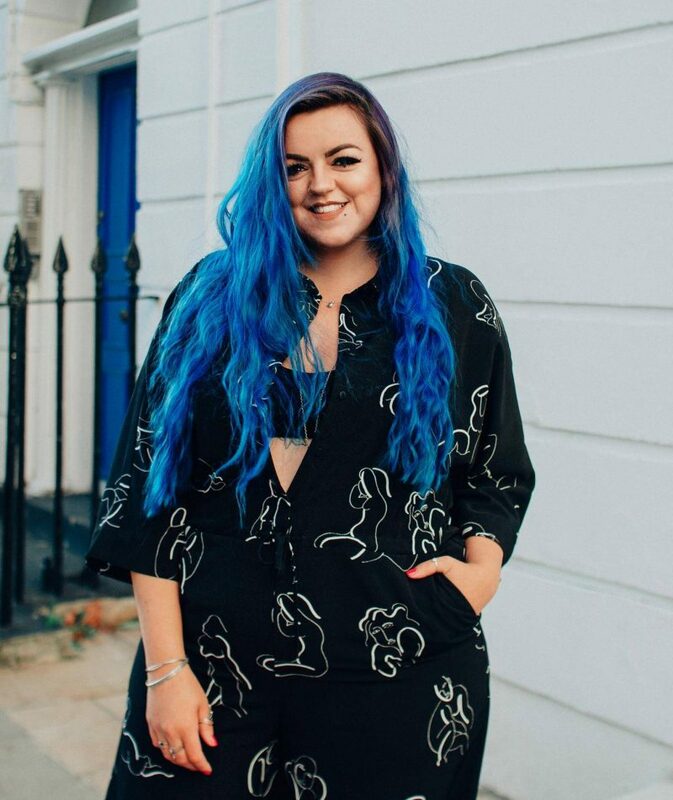 That’s not necessarily a bad thing, but I don’t think the lightness of colour is easily wearable on a day-to-day basis for me. Whenever I see LUSH bottles filled with pink, I always instantly thing of Snow Fairy shower gel. However the consistency of the Prince Charming Shower Cream is compleeetely different (as is the smell). I used it in the shower this morning and when you squeeze it out of the bottle, it’s almost opaque like paint! Somewhat unexpected but it has a soothing lather and has an impressive list of ingredients, including: Marshmallow Root and Vanilla Pod Infusion, Grapefruit Oil, Fresh Pomegranate Juice and you guessed it, Cocoa Butter. 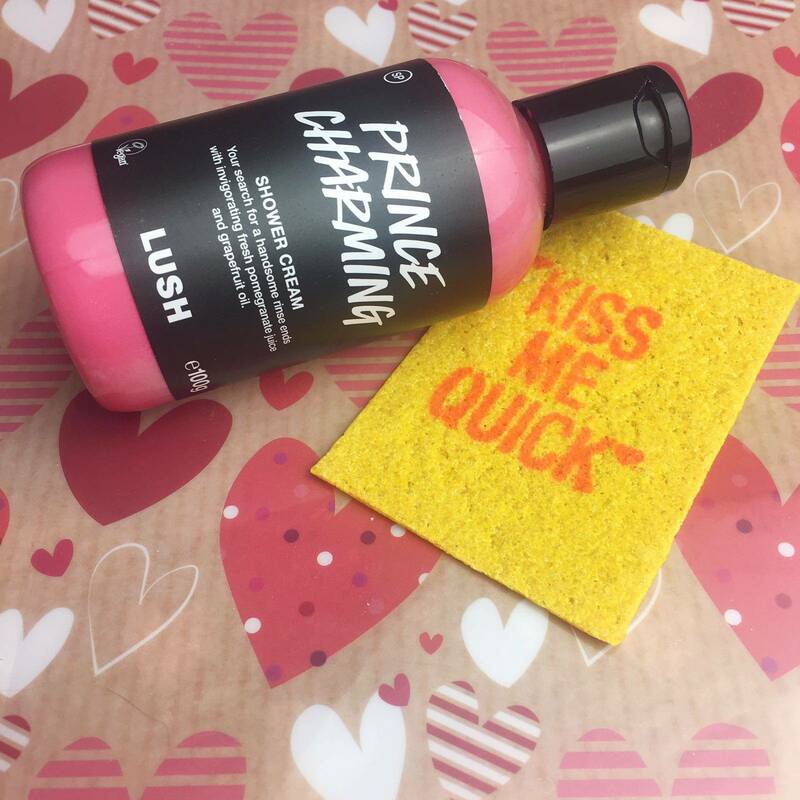 The colouring of the Kiss Me Quick Business Wash Card baffled me a bit, considering it’s part of the LUSH Valentines range and didn’t seem to match with anything else. However not that that matters once you’re all lathered up in the shower. I love the idea of these business wash cards – perfect for an overnight stay or weekend break. It was my first time hearing of them, let alone buying one! They can be used in one go, or broken into bits and you simply rub it on your skin when you’re in the shower and voila! I love that this particular card has Apple pulp in it as well as Lemon, Lime and Ylang Ylang oil… I’m going to smell like a fresh fruit bowl after I try it! 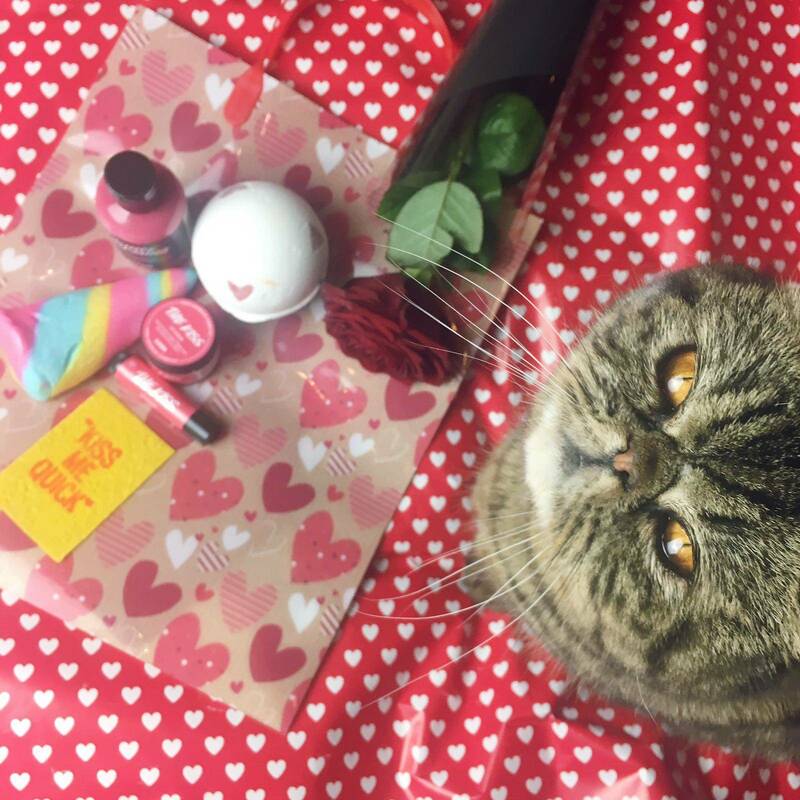 That’s all for now, but I’ll leave you with some outtakes including Ozma, my housemates very cute cat (who you might have seen before in previous blogs). 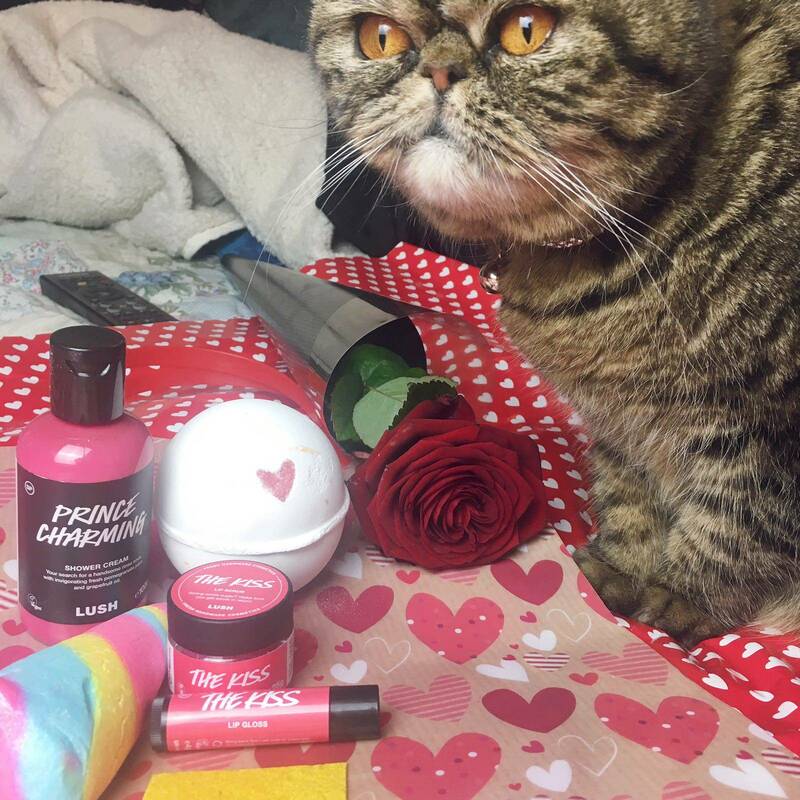 If you enjoyed this LUSH Valentines blog, pretty sure you’ll love my post about what I got in the LUSH Christmas Sale (also ft. cute kitty pics – she’s loves the attention), or my post about the Vegan friendly treats you can grab at Hotel Chocolat (also including kitty pics)! 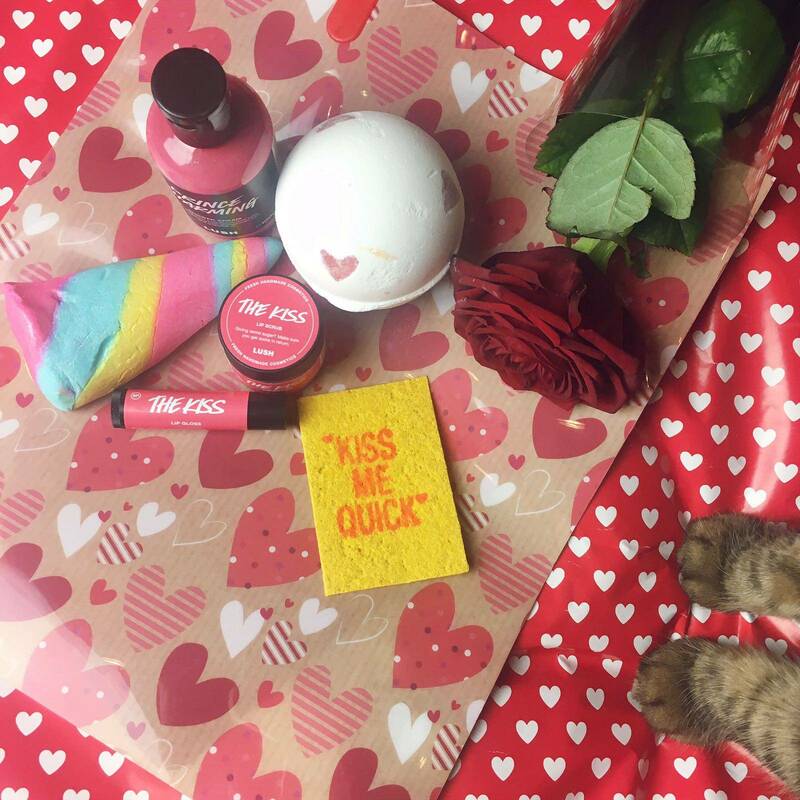 Thanks for sharing your haul… loved it! Awh hey Stacey! 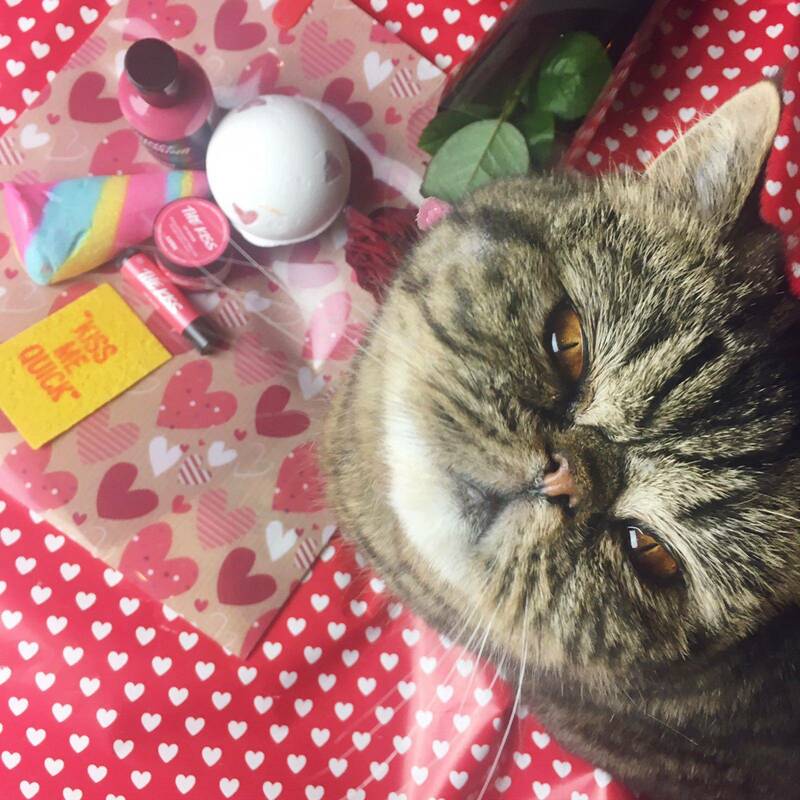 Thanks for reading – can’t wait to try the rest of the bits that I bought, definitely a case of too many scents and too little time, haha.